BHU PET Counselling 2018: Banaras Hindu University is going to conduct BHU PET Counselling from 4 July 2018 for admission into various post graduate programmes including M.A, M.Sc, and M. Com. All the candidates who successfully qualify BHU PET 2018 must attend BHU PET Counselling Schedule on the specified dates. Through the counselling process, applicants will be allotted the seat in PG courses. Therefore candidates can also get here BHU PET Cut Off Marks 2018 and get details of qualifying marks required for the examination. For more details check the article below. Banaras Hindu University is one of the prestigious University, which offers admission to various courses. Applicants who have recently appeared for BHU PET 2018 and whose name appears in BHU PET Merit List 2018 must further attend the Counselling Process. After declartion of Results, the BHU PET Counselling 2018 is going to be conducted tentatively in the month of July 2018. The university will adopt the computerized process for BHU PET Counselling Procedure for admission to various PG Courses. The counselling process includes a number of subsequent rounds such as registration, choice filling, fee payment etc. The University will conduct the BHU PET counselling in the first week of July. Thus applicant can check below BHU PET Counselling Date and have detail knowledge about the counselling. 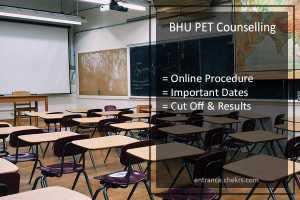 BHU Online PET Counselling includes a number of subsequent steps for admission to various colleges. Thus the details of counselling process is discussed below. Candidate must reach the counselling venue and mark his attendance first. Further, he/ she must go for document verification process, check for the available options and make changes if required. The preference entry form once signed by the candidate on the counselling date will be final and not be changed and accordingly, seats will be allotted don merit basis. After the candidate receives a provisional allotment letter, he/ she must proceed for the payment of admission fee. The fee can be made through online mode via credit, debit card or either in the fee counter. After the end of counselling the computerized rearrangement and BHU PET Seat Allotment will be done on the basis of merit and preference made by the candidate. However, the final allotment will be done after the expiry of the final deadline. After the declaration of BHU PET Results, the authority is going to declare BHU PET Cut Off List, which includes the minimum marks the candidates need to secure to become eligible for BHU PET Admission 2018. Therefore the cut-off will be determined on the basis of total candidates, highest marks, category etc. For more updates stay tuned to our portal. In regrads to any query place your comments below.